1861. "Washington, District of Columbia. Tent life of the 31st (later, 82nd) Pennsylvania Infantry at Queen's Farm, vicinity of Fort Slocum." View full size. Wet-plate glass negative, left half of stereo pair, photographer unknown. Submitted by Dave on Fri, 05/16/2008 - 7:08pm. 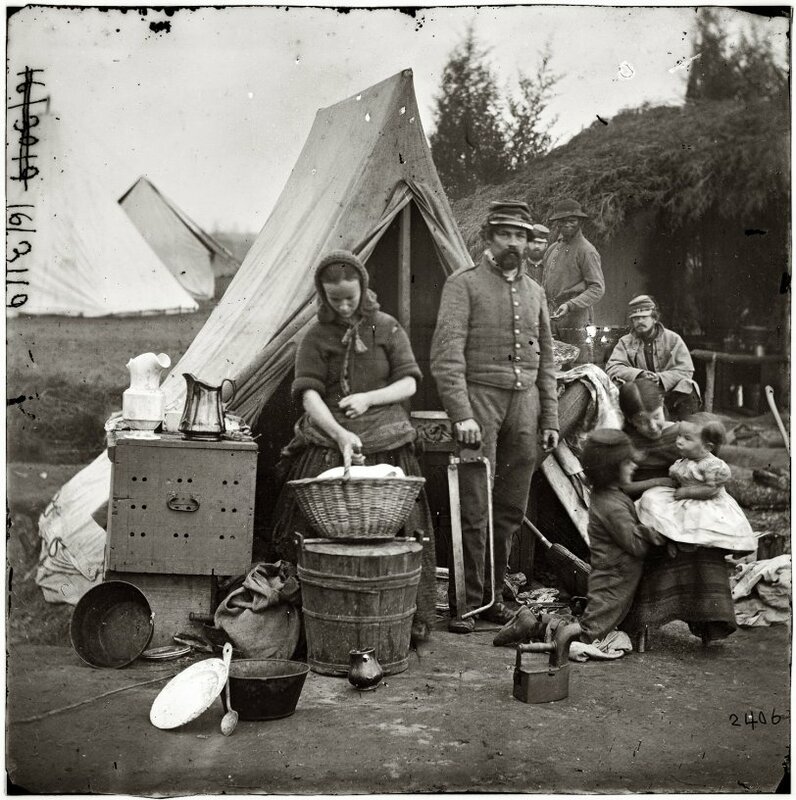 LOC annotation for these photos: Princess Agnes Salm-Salm, wife of Prince Felix of Prussia, who served with the Union Army, observed in January 1862 that the winter camp of the Army of the Potomac was "teeming with women." Some wives insisted on staying with their husbands, which may have been the case with this woman, judging by her housewifely pose alongside a soldier, three young children, and a puppy [this photo]. In addition to taking care of her own family, she may have worked as a camp laundress or nurse. Some women who lacked the marital voucher of respectability were presumed to be prostitutes and were periodically ordered out of camp. Only gradually during the four years of the war, and in the face of unspeakable suffering, were women grudgingly accepted by military officials and the general public in the new public role of nurse. Submitted by Anonymous Tipster on Fri, 05/16/2008 - 1:47pm. Surgical saws can indeed be that large. Submitted by Lord-Velveeta on Fri, 05/16/2008 - 12:06pm. It is indeed a bone saw, we found a practically identical one from my grandparents' house after they passed away. I was informed that it was used to cut bones when butchering beef, pigs and game, as my family had no doctors in it. So this gentleman may have been a camp sawbones, or butcher or maybe simply repurposed a saw he found. Submitted by Anonymous Tipster on Fri, 05/16/2008 - 11:06am. Anyone know what the chest with the holes in it (on the left side of picture) was for? I immediately think of it holding living thing, or maybe bread, but perhaps it's simply for ventilation, so the interior won't get too hot or musty. Anyone know? Submitted by R.V. Droz on Fri, 05/16/2008 - 9:31am. I'm surprised no one commented yet on that huge saw. It's obviously not a wood cutting implement. Those kind of blades had much bigger teeth to bite into the wood in that day. A precision hacksaw like that was used for amputations, the kind that gave rise to the doctor's nickname "Sawbones," later famously shortened to "Bones". Submitted by Anonymous Tipster on Fri, 05/16/2008 - 8:25am. Amongst all the grittiness, you'll find on the left a beautiful white ceramic pitcher. How long was the exposure time for making photos in this era? You'd expect the children, especially, to be blurry due to their constant movement, but they are almost crystal clear and frozen with expression. Fabulous photo. Submitted by Anonymous Tipster on Fri, 05/16/2008 - 6:53am. How common was it for soldiers to have their whole families with them? Better yet, WHY were the families with them? Here I was, thinking I knew so much until Shorpy comes along and turns everything I thought I knew on it's head. Thanks! Submitted by Joyce on Fri, 05/16/2008 - 6:52am. Is that an iron on the ground (middle, front of picture)? If so, what is the spout for except, perhaps, water? Anybody know? Submitted by PGCist on Fri, 05/16/2008 - 5:33am. Great photo. I still can't envision working farmland within the District. Richard Queen's family operated a 1,000-acre farm that stretched from Rock Creek Church to what is now the Langdon neighborhood in Northeast. Queen's Chapel Road is named after his estate chapel, which serviced the growing Catholic community in Prince George's County and, after 1792, the District of Columbia.